Choose a size below: -------------------- Unreinforced 5/8" id. x 2" Unreinforced 5/8" id. x 3" Unreinforced 5/8" id. 12" Unreinforced 3/4" id. x 2" Unreinforced 3/4" id. x 3" Unreinforced 3/4" id. x 12" Unreinforced 7/8" id x 2" Unreinforced 7/8" id x 3" Unreinforced 7/8" x 12" Reinforced 5/8" id. x 2" Reinforced 5/8" id. 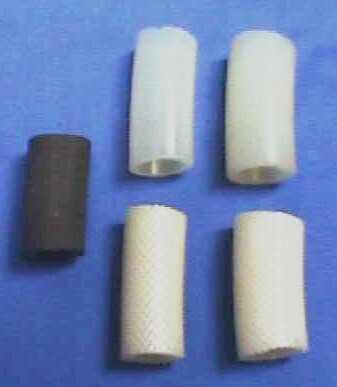 x 3" Reinforced 5/8" id. x 12" Reinforced 3/4" id. x 2" Reinforced 3/4" id. x 3" Reinforced 3/4" id. x 12"
We carry a line of Silicone Couplers for racing and recreational applications. Cream-colored Silicone in a thick 3/16" wall provides positive connection between your motor and pipe. We also offer reinforced silicone for even greater strength and longevity. For proper application, remember to keep the gap between the header of the motor and the pipe as small as possible.